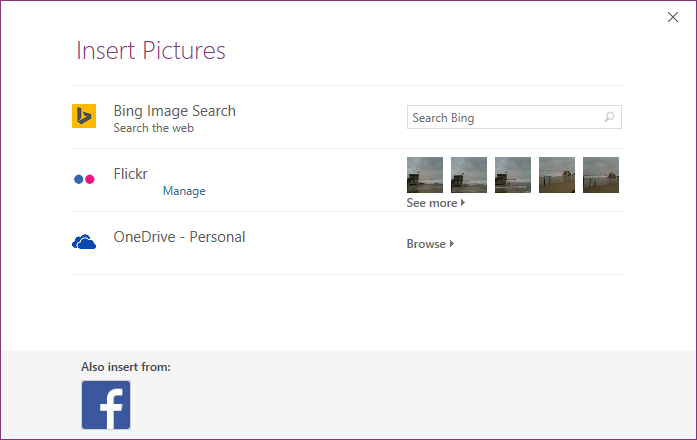 Integrated Bing image search is an easy way to add photos to your documents. Microsoft made it much easier to add images to your documents starting with Office 2013, by integrating Bing image search directly into the suite. That was a nice addition, but recently Microsoft’s Bing and Office teams got together to improve the overall Bing image search experience inside Office. When you search for images with Office programs on the desktop you can now add filters for size, type, and color, as well as easily find out other information about the photo. Microsoft’s image insertion works with Excel, OneNote, Outlook, and Publisher in Office 2013 and 2016. 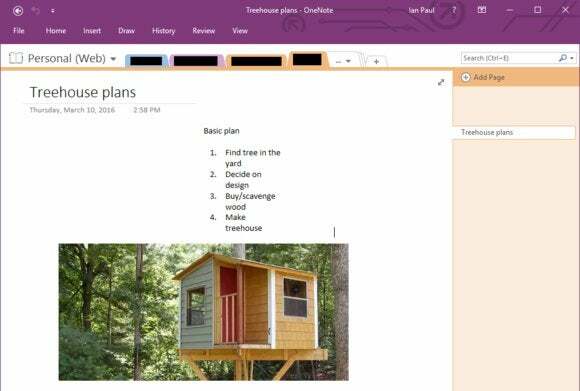 In our example, we’ll use a OneNote page and search for tree house images to get ideas for an upcoming project. To start searching for tree houses, open OneNote and go to Insert > Online Pictures. A window pops up with all the various locations we can search for images such as OneDrive, Facebook, Flickr, and Bing. 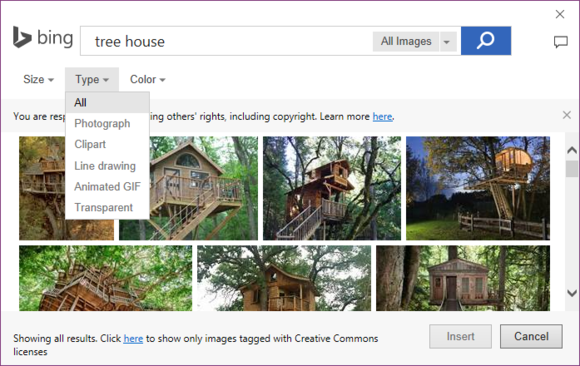 Enter “tree house” into the search box for Bing Image Search and press Enter on your keyboard. By default, Bing searches only for images with Creative Commons licenses. That’s an important filter when giving a public presentation or creating corporate documents but doesn’t really matter for a personal notebook. Click the drop down menu in the search bar that says CC Only and choose All images. We can also filter image searches by size and color, which are pretty straightforward options. The Type filter, however, is one to pay closer attention to. Here we can filter our image search to show only photographs, clipart, line drawings, transparent images, or animated GIFs. None of those options suit our purposes here, but if you’re doing a corny newsletter in Word the clipart option could be helpful. Likewise, animated GIFs may come in handy to add a little comedy to your next PowerPoint presentation. Once you find an image you’d like to insert into your document, hover over it to see which site it comes from, and click through to the site if you wish. Otherwise, select Insert and the image is automatically dropped into your document. Depending on the program you’re using, you may see further options for enhancing your image with effects frames and shadows. None of that exists in OneNote, so in this instance we’re done.